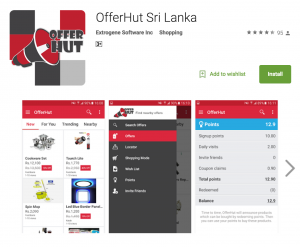 OfferHut Sri Lanka – A unique location based shopping app for android users in Sri Lanka. OfferHut app – Google Play Screenshot. OfferHut android application simplifies how you find offers. In the modern society, every one needs smartphone apps for everything. We here you and why not an android app for OfferHut? It simplifies how you browse through offers nearby and giving you a whole new experience in searching offers. What you will have in OfferHut Sri Lanka application. In OfferHut android app, we facilitate you to navigate through new offers, offers just for you, trending offers and nearby offers in the home screen itself by swiping left and write. You can use locater from the navigation bar in case you want to find a place where you can buy something you need. You can search by product name and it will list the nearby shops where the item will be available with offers. In addition to searching offers, you can collect OfferHut points easily using your android mobile app. You can invite friends to install the OfferHut Sri Lanka app and it will bring you more points. Time to time, OfferHut will announce point redeemable products and you can buy those products using OfferHut points. This is must have app for shopping lovers. Anyone who would like those features plus more in shopping and product searching should definitely install and use the app everyday. Install OfferHut Sri Lanka from Google Play now to be amazed with the unique shopping experience in Sri Lanka.